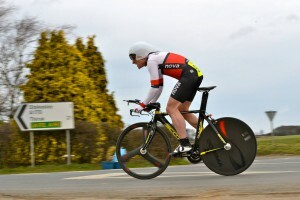 Home › News › Mullier starts TT season with Two podiums and two veteran wins! Mullier starts TT season with Two podiums and two veteran wins! The Time Trial season opened in late February with the first Yorkshire Cycling Federation points series event on the Great North Road at Fairburn. The ten mile “roundabout dodge” on a cold and windy day was a stern test. Harrogate Nova’s Duncan Mullier appears to have made a leap forward over winter because he won the veterans’ competition and was third overall, with a course PB improvement of exactly a minute, behind YCF champion, Andy Jackson of Team Swift and Jonathan Wears of Team Jewson/MI Racing and head of Team Swift’s Blaine Metcalf and seventy three other finishers. Yorkshire Road Club’s Mike Shacklock won the 70s category. The following week 110 starters rode the popular Cleveland Wheelers Hilly 21 mile Time Trial at Stokesley. Mullier continued his form with another veteran win and third place overall, behind a brace of professional riders. Harry Tanfield, of JLT Condor, broke the course record (previously held by Olympic medallist Chris Newton) to finish first (42:25) ahead of Josh Teasdale (42:47) of Prorace Cycling Team. Team Swift’s Blain Metcalf shared the podium with Mullier having both recorded 45:29. Local rider, Glen Turnbull of Patron, also produced a stunning ride to finish 7th with 46:21. Nova’s Richard Hamilton, back after a season out with injury, came home in 48:39.